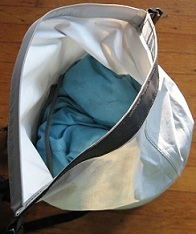 This stuff sack combines the packability of compression sacks with the protection of waterproof dry bags. The bag is made from air-permeable eVent waterproof fabric that allows the air to escape when the bag is compressed while still maintaining the waterproof seals. The top of the bag has a dry bag closure - two stiff sections that must be mated and folded over at least three times to create an effective watertight seal. Like a compression sack, the lid is attached with 4 straps and sliders that can be evenly tightened to compress the whole stuff sack. The rolled top and buckle closure. To use this sack, I stuff my sleeping bag into it, leaving some space at the top. Then I mate the top pieces, press out any extra air from the top and roll the top down at least three times. I then snap the buckle to keep the folds securely in place. To compress the bag I loosen all four of the compression straps, slip the end cap over the folded drybag top and cinch the compression straps. I synch two opposite straps at a time to avoid a lopsided bag and continue to compress the bag until the desired shape is obtained or I can no longer compress the contents. The eVent fabric is specially designed to allow air to escape from the bag during compression but the air release is relatively slow, so it is much easier to remove as much air as possible before the seal at the top is created. 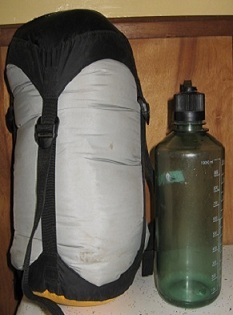 I have used this compression sack to carry my sleeping bag for at least 25 nights on backpacking and sea kayaking trips. This includes multiple sea kayaking trips in upstate New York, and a backpacking trip to Zion National park in Utah. It has been shoved into kayak hatches, sat all day in unavoidable kayak water, and traveled crammed into a pack with other gear. Temperatures encountered range from 0 F to 100 F (-18 C to 38 C). 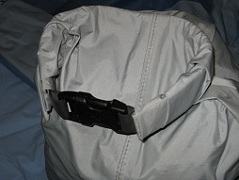 I usually use this compression sack to hold my sleeping bag (a Marmot Women's Pinnacle). This sleeping bag comes with a 7 x 14 inch (17.8 x 35.6 cm) stuff sack, so purchasing the small compression sack (7 x 16 inch or 17.8 x 40.6 cm) was a bit of a stretch. Two inches (5 cm) is not a lot of space to make the watertight seal, but I hate trying to carry large compression sacks that become basketball-shaped when compressed. At first, it seemed impossible to stuff in, but with time has become easier and is worth the extra work for the shape that is easier to pack. Water protection: I have used this compression sack in quite possibly the worst of conditions. When I am kayaking, this compression sack containing my sleeping bag sits in my kayak all day in the half-inch (1 cm) or so of standing water in the bottom of the boat that is nearly impossible to avoid. I have never had a problem with any moisture reaching any part of my sleeping bag. I trust the compression sack completely for my down sleeping bag. If I were to carry sensitive or expensive electronics in this bag I would take the manufacturer's recommendation to double bag because of the potential damage that a leak would cause. Durability: The fabric on this compression sack is durable, with seams that are so sturdy that I have not thought once about them or their ability to hold up to the pressures of stuffing in a sleeping bag or cinching down the compression straps. The seam sealing and waterproof fabric has held up well to four years of heavy use. 1) It is heavier and more expensive than most stuff sacks, but I think it is worth the extra cost and weight. I am glad that I purchased this stuff sack for my sleeping bag and will purchase the same compression sack again when necessary. It is indeed waterproof, durable, and easy to use. It is a piece of gear that I just don't have to think about but can depend on.